One of the most misunderstood minority religions in the world today, Wicca involves a wide variety of different beliefs and practices. Contrary to popular assumption, Wicca and Witchcraft are not always the same thing; though many practitioners of the former do refer to themselves as “Witches” rather than “Wiccans.” Its adherents stand just as eclectic as the more popular faiths, and many unfamiliar with the components of Wicca and Witchcraft will be startled to note the similarities they share with one another. This listing, in no particular order, did give preference to listing blogs that explicitly address Wiccan concerns – even if they exist as general neo-Pagan resources – and appeared to update on a regular basis with few large chunks of inactivity. However, some more generalized Witchcraft blogs were added to bring about a bit of diversity as well. This extremely comprehensive blog boasts archives dating all the way back to 2006, providing information on everything from spells to addressing common misconceptions about the religion. Paganism, politics, sociology and city life converge into one well-written, intelligent resource on the role of Wicca in today’s world. Wiccans hoping to raise a family within the tenets of the religion will adore this fun, whip-smart blog on domestic Paganism. Mama Kelly and Lady Rose share their thoughts and experiences about a wide variety of neo-Pagan topics – including Wicca! – with considerable warmth and humor. Although Wicca and Druidism are not the same thing, this illuminating blog by Grand Archdruid of the Ancient Order of Druids in America John Michael Greer frequently discusses nature-based philosophies and spells and issues regarding neo-Paganism that Wiccans may find fascinating and helpful. Jason Pitzl-Waters provides neo-Pagans a great forum to debate all the issues relating to their practices, discussing philosophies, events and issues relevant to the community. Read cybercoven.org for great spiritual insight on how magick helps one woman live a more comfortable, stable existence. Witches from all backgrounds converge at this handy resource, which peers into different perspectives to broaden minds and establish similarities between different neo-Pagan traditions. Explore Celtic and Norse traditions that may enhance Wiccan practices as well as advice on different spells and useful botanicals. The official blog of The College of the Sacred Mists supplements its lessons on Wicca with a general interest resource covering all the practical and spiritual basics. “Author, Magician and Esoteric Researcher” David Rankine plunges the depths of grimores and other works of occult literature and shares with the neo-Pagan community – including many of particular interest to Wiccans! Political Scientist Gus diZerega blogs about policy and religion alike, with special attention paid to the specific needs of neo-Pagans. Wicca frequently factors into many of his postings. Popular neo-Pagan writer and founder of Dianic University Online Zsuzsanna Budapest uses her personal blog as a conduit for discussing intersections between feminism and Wiccan spirituality – among other issues! Cat Chapin- and Peter Bishop open up about their particular brand of religious pluralism – merging Pagan (including Wicca) spirituality with Quaker traditions. It may seem unorthodox at first, but certainly stands as a great example of people setting aside their differences and participating in an open community. Drop in on Letters from Hardscrabble Creek for musings on Pagan culture, politics and practices that frequently embrace the needs and interests of Wiccans. 9 contributors from vastly different political and Pagan backgrounds weigh in on the latest issues and events through their own unique lenses, looking at how they impact their respective religious communities. Wiccan fathers hoping to find ways to lead their children down the Pagan path would do well to explore this resource, which offers fantastic advice on a wide variety of different traditions. Read about Goddess worship, feminism and neo-Pagan spirituality on this bold, provocative blog. Follow along with all the latest events, issues, philosophies and advice from within the Witchcraft community with this broad, engaging blog. Poet Annie Finch shares and reflects upon her poetry and the facets of Witchcraft that inspire it. A Heathen’s Day dissects the current social and political climate, analyzing how they impact the neo-Pagan denominations. Anyone seeking spells, perspectives and advice from the Celtic tradition would likely enjoy the content offered by A Pagan Tapestry. Many Witches and Wiccans embrace environmental, sustainable political causes, and moonroot dishes out valuable advice on spells, meditations and other ways for the community to protect the planet. About.com’s portal to Wicca and Paganism focuses on general spiritual, political and social issues relating to the affiliated belief systems. This general Witchcraft blog covers everything that practitioners of all levels need to know about the religion. The frequently heartwrenching blog The Walk of the Fallen peers into how one veteran and her husband (also a veteran) use their Cretan labyrinth to pray for their sons (both soldiers) and others serving in the American armed forces. Wiccan Together hosts both a communal blog as well as forums and other ways for practitioners to network and exchange ideas and insight on a number of different topics. Stop by Hecate for feminist and environmental issues as seen from one Witch’s point of view. An intensely personal blog by Livia Indica, Magic in These Hills reflects how Witchcraft has helped her live a more comfortable, peaceful life. Practitioners or Solo or Eclectic Wicca may want to explore the detailed and informative SpellWorks as a great primer on what to do and how to do it. Author Gregory Branson-Trent keeps this blog in order to share his findings on various spells, spell components and neo-Pagan practices that Wiccans and Witches may find interesting. Suite101 writer Joanne E. Brannan hosts a number of contributors exploring issues and practices within Wicca and related neo-Pagan traditions. A Wiccan flying solo wants to share all her experiences and findings within the religion, blogging about how it interacts with other belief systems and the sciences. Spells, meditations and other components of Wicca do not have to focus on the grandiose. Sometimes they can impact tiny facets of existence, sending out giant waves of change from one small gesture. One Solo Wiccan muses on the tradition’s role in her life, providing a primer on various components for beginners or more advanced practitioners looking for a little refresher. 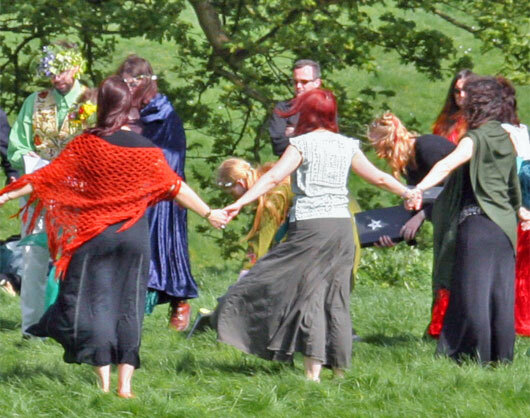 Paganism comes in a wide variety of “flavors” – including Wicca! – and this blog emphasizes the commonalities and differences between them. Thoughts From a Threshold peers into the practices, sociology and politics of contemporary Paganism, not discriminating based on denomination. 2 elderly Wiccans keep a blog on Numerology and general topics regarding their chosen religion and culture. Stay up-to-date with the latest books on Paganism, Witchcraft, Wicca, the esoteric and the occult with this intelligent, informative resource. Frater Barrabbas Tiresius does not blog exclusively about Wicca, but he does discuss numerous general ruminations and instructions on different magick practices they may find of particular interest. Aimed a Pagan moms and dads, this blog provides recipes, spells, parenting tips and more. Wiccans who feel a particular affinity with nature have plenty to love and appreciate with this creative, feminist blog. The tenets of Witchcraft and Wicca (and Paganism as a whole) have myriad applications in day-to-day domestic life. As the title implies, Rowan Pendragon’s blog opens readers up to her own interpretation of Pagan spirituality and practice, which frequently involves discussions regarding Wicca. Witches attending college in the present or hoping to do so in the future will enjoy reading up on how to use positive spells to improve their experiences and the experiences of others as well. Another Witchcraft and Wicca blog dedicated to using the religions’ practices for the betterment of a home. It may not update as frequently as the other blogs on this list, but the Wicca Everyday podcast deserve a listen for its neat insight into practicing Paganism. Bringing Up Salamanders, as of this writing, is currently on hiatus. However, visitors can still look for some great information on raising a family with Wiccan values all the same. This incredibly fun, informative blog reaches out to Wiccans and Witches who love to cook and spread food and hospitality alongside their magicks. Drop by The Simple Witch for insightful news, views and information on Wicca and other facets of Witchcraft and neo-Paganism. Wiccan spirituality embraces diversity and free will, and those who choose to follow that particular path frequently find themselves facing down discrimination and misunderstanding. Neither them, nor the vast majority of their neo-Pagan contemporaries, align themselves with the Christian concept of Satan. Hopefully, reading through this eclectic selection of perspectives and practices will shed light on how these belief systems perceive and seek to alter the world around them.